The old First National Bank building on West College Avenue will soon be home to BRGR. While some historic pieces of downtown State College have been demolished, the new year will see the column-fronted, stately structure at 122 West College Avenue standing. The inside, though, will have significant changes in keeping with its new life. The locked building – where banking was established more than 100 years ago – will reopen next spring. No longer handling currency, comestibles will be served. Expanding here, a Pittsburgh-area chain centered on gourmet burgers will make this its sixth restaurant. Doing so, it steps into State College history. On December 15, 1904 – prior to being in its own building – “The First National Bank opened its doors for business,” says Wayland Fuller Dunaway’s 1946 History of the Pennsylvania State College. So, this was State College’s first First National Bank. The multi-branched bank currently operating under that name was originally Peoples National Bank, situated where the downtown branch is today, around the corner at 117 South Allen Street. Peoples was the second town bank, organized April 19, 1923. Through the years, bank mergers have scrambled the names. This explains the disparity on South Allen Street between today’s First National Bank and its old “Peoples National Bank” clock, standing out front. In 2016, when management closed the old-fashioned first First National, it was a Citizens Bank. When the building reopens, the business inside will be called BRGR. Along with its gourmet hamburgers and handmade milkshakes, a bar is envisioned for the former tellers’ row. Smokehouse, until 2014. (I once ate outside the vault in one of them.) Today, the bank building stores parts. The conversion in State College will add another restaurant to the downtown’s 100 West College Avenue block, which has long had eateries. At the eastern end is The Corner Room, in operation since 1926. Close to the other end, at 132 West College, was the former Herwig’s Austrian Bistro (first in a smaller version near Calder Way). It served ethnic cooking for 16 years. Now, customers at the site munch pizzas. About mid-block was a diner at 126 West College that generations esteemed. Its name varied: College Diner in the 1930s, New College Diner or, familiarly, “the NCD,” in the 1940s, ’50s, and ’60s; (competitive Penn State Dinner was there part of the time); Ye Old College Diner in the ’80s; The Diner, recently. The 100 block used to cater to customers 24 hours a day. The NCD, for one, was known to be a beacon for college students studying for exams, for solitary souls seeking company, and an easy gathering place on Christmas Eve and New Year’s. Clarification: “finer,” NCD; “less finer,” Penn State Diner, whose size varied (Herwig’s would fill some of its space); “least finer,” the 1940’s-style Electric Dinner, 145 South Atherton Street (where I never repeated my first meal). At least one 1951 State College High School student knew both the NCD and the First National: Betty Shirk, 87, owner of the former State College Floral Shoppe, opened by her husband’s family in the late 1920s and closed by her and a daughter in 2012. On weekends, she was a waitress, wearing whatever suited, not the staff T-shirt the place became known for. Her first job after high school was at the First National “on what they called the posting machine. It was a large, cumbersome machine and it made a terrible noise,” she says. Her job was crucial – entering accounts. One 1961 State High graduate had a very different view. En route to his law degree, Ron Friedman conferred with Mr. Truby about a car loan. He appreciated the handshake that seemed to happily authorize it. 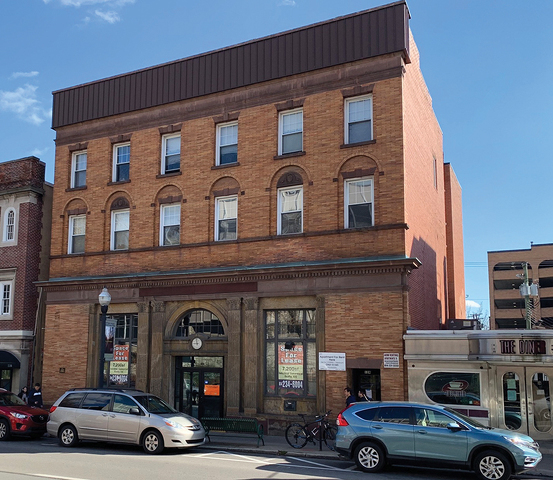 Years later, when the family owned the building, he discovered that his dad, Sidney (after whom State College’s downtown park is named), had backed what seemed to a young guy only a handshake transaction. For the old bank’s new life, interior changes have included removal of the marble surfaces typifying historic big banks. Penn State professor of paleontology Roger J. Cuffey got some for fossil research. Gone also is the 1950s mural by former PSU architecture head and accomplished architectural illustrator Milton S. Osborne. It couldn’t be removed, but it was photographed. When future BRGR customers open the door, they should know that they are entering an early 1900s facility that helped this university community to take root and grow. Nadine Kofman is a native Centre Countian and historian.